In 1849, Henry David Thoreau, a leading member of the Transcendentalist movement, published “Civil Disobedience,” an essay that advocated the morality of resisting unjust civil government. Over the next 100 years, two prominent historical figures, Mohandas Gandhi and Dr. Martin Luther King, Jr, would rise to prominence by using peaceful, non-violent tactics based in part on Thoreau’s theories. Gandhi and King were not alone; as early as 1942, the Congress of Racial Equality (CORE) convened seminars and workshops on non-violence and led passive resistance efforts in Chicago, Illinois. The sit-in model came to national prominence on February 1, 1960, when Joseph McNeil, Franklin McCain, Ezell Blair Jr.(Jibreel Khazan), and David Richmond, students at what was then known as North Carolina A&T College (now NC A&T State University), held a sit-in at the Woolworth’s Department store lunch counter in Greensboro, North Carolina. The four men (shown below) stayed—unserved—until the close of business. 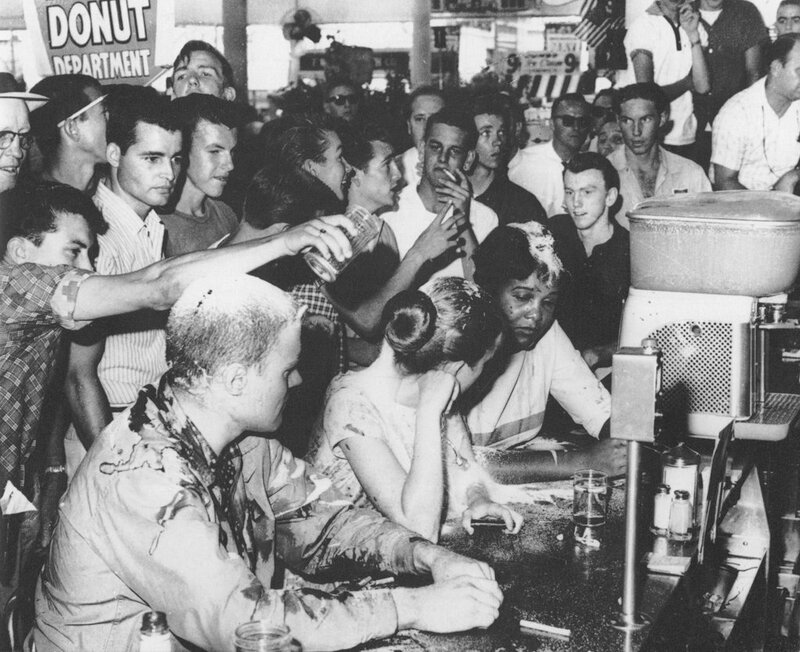 The following day, 20 more students joined them at the lunch counter and while none received service, they sat valiantly as white counter-protesters hurled racial epithets and indignities. By the third day, nearly 300 students crowded into Woolworth’s and the Kress Department Store demanding equal service. With television cameras beaming images of the civil disobedience by the black students and the negative reactions from their white hecklers, Woolworth’s defiant national office issued a statement that they would continue to adhere to the local custom of segregation. In the interim, sit-ins were being replicated throughout North Carolina in Raleigh, Durham, Winston-Salem and Charlotte; and later throughout the South in Lexington, Kentucky, Nashville, Tennessee and Tallahassee, Florida, where student leader Patricia Stephens (Due) led efforts to integrate downtown venues despite the threat of expulsion from her school (Florida A&M) and the ever looming promise of incarceration by local law enforcement. The sit-in movements, much like the CORE sponsored “Freedom Rides” and SCLC protests marches, were valuable tools in showing the world the negative aspects of Jim Crow and the lengths that some whites were willing to go to maintain the status quo. Where the sit-ins were perhaps even more valuable was that as a form of boycott, they hit the business class squarely in the pocket. Blacks, no longer willing to pay for food at the back door of restaurants or buy clothes without the privilege of trying them on, caused many of these establishments to suffer tremendous losses and eventually change their ways for the sake of commerce. Still, the sit-in model used during the late 1950s and 60s was the natural progression of the earlier forms of direct civil disobedience in the form of the Montgomery Bus Boycott. While arguably the most famous example of civil disobedience during the Civil Rights Movement, one that thrust Rosa Parks into the national limelight when she was arrested for refusing to give up her seat on the bus, the truth is that even 13 years earlier, then Army 2nd Lieutenant Jackie Robinson, shown below, who would later garner fame for integrating Major League Baseball, was acquitted following a court-martial in Fort Hood, Texas when he refused to move to the back of the bus. Four years later, the NAACP successfully litigated the case of Irene Morgan vs Commonwealth of Virginia, where the United States Supreme Court in 1946 ruled that Virginia’s Jim Crow law regarding bus seating violated the Constitution’s Commerce Clause that regulated interstate commerce, including busing. Several years later, in 1953, the Baton Rouge City-Parish Council enacted Ordinance 222, which eased race based reserve seating requirements and allowed blacks to sit in forward sections so long as no whites were seated previously. This law was passed after blacks in Baton Rouge, led by Rev T.J. Jemison, boycotted the city bus lines for eight days. With that backdrop, it is perspicuous that black leaders in Montgomery were not responding in a knee-jerk fashion following the arrest of Rosa Parks, as it is popularly taught in many American history classes. Rather, Parks’ act of civil disobedience–and the resulting boycott–were carefully and masterfully planned. Indeed, almost eight months before Parks’ arrest, Claudette Colvin, a 15-year-old student at Booker T. Washington High School and a member of the NAACP youth council in Montgomery, had been arrested for violating the segregated seating code. Nixon would later be instrumental in tapping Dr. Martin Luther King, Jr, a 26-year-old who had only recently been installed as pastor of Dexter Avenue Baptist Church, to lead the burgeoning movement. Nixon intuited that King, an Atlanta native, had not lived in Montgomery long enough to be intimidated by white city leaders. Another young pastor, Ralph David Abernathy, who was born in Linden, Alabama and had attended college at Alabama State University, an HBCU in Montgomery, agreed that King would be the right choice. The pair would then lead the newly formed Montgomery Improvement Association, which was founded four days after Parks’ arrest to organize the boycott. While the boycott continued and struck a serious economic blow to the city’s bus line, in June of 1956, the US District Court in Montgomery ruled that segregated seating was unconstitutional. This ruling was upheld by the US Supreme Court on December 17, 1956–a little over a year after Rosa Parks was arrested. A week later, the Supreme Court issued a mandate that the segregated seating end immediately, thus providing one of the first major victories for King and Abernathy in what would become a fourteen year collaboration to fight for civil rights.